Marblehead Massachusetts is a quaint coastal community located 18 miles northeast of Boston, surrounded mostly by the Atlantic Ocean with land borders of Salem and Swampscott Massachusetts. Founded in 1629, this little peninsula that extends into Massachusetts Bay has contributed to the American Revolution and the Civil War and is known as the birthplace of the U.S Navy. The many miles of coastline lend to the beauty of this wonderful little town and the many attractions that draw visitors from around the world. Currently known as the Yachting capital of the world, Marblehead is home to the oldest junior yacht club in the United States; the Pleon Yacht Club. The club continues to grow its members and offers a variety of activities on and off the water. The harbor, abound with sail boats, fishing vessels, lobster boats and pleasure boats is a sight to behold. Once mainly supported by the fishing industry, Marblehead is now a residential community with unique shops and minor industry. The narrow streets with 17th and 18th century style buildings are the inland attractions. "Downtown" Marblehead is as beautiful as the coastline with the crooked roads such as Gingerbread Land and Knights' Hill Road that were once rights of public passage and are still open to the public to access many other attractions that Marblehead has to offer. There are many parks, playgrounds and beaches offering a variety of opportunities for sports, picnics, swimming and leisure time for everyone to enjoy. Marblehead Neck, an extension of the peninsula connected by a long sandbar on the eastern side defines Marblehead Harbor. Marblehead Neck is home to the Massachusetts Audubon Bird sanctuary, Castle Rock, Chandler Hovey Park and Marblehead Light the only lighthouse of its type in New England. Marblehead offers eight public schools including a middle and high school. Marblehead was also the first to open a charter school in the Commonwealth of Massachusetts; Marblehead Community Public Charter School. 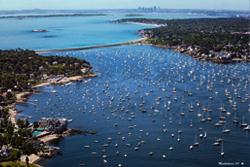 A beautiful and peaceful place to live and play, Marblehead presents pristine harbor side homes and ocean front property and exquisite residential properties in tasteful cul de sac neighborhoods, many offering beach access. If you are thinking of buying or selling property in Marblehead, contact our office and we will connect you with an agent who is very knowledgeable of the area. The agents at RE/MAX Advantage are long term locals and love to share their knowledge and love for the community. They are highly trained and have the most sophisticated tools behind them to help you find your dream home or sell for the highest price. We have provided some community links and quick property searches on the right side of this page so you can begin to explore Marblehead on your own.